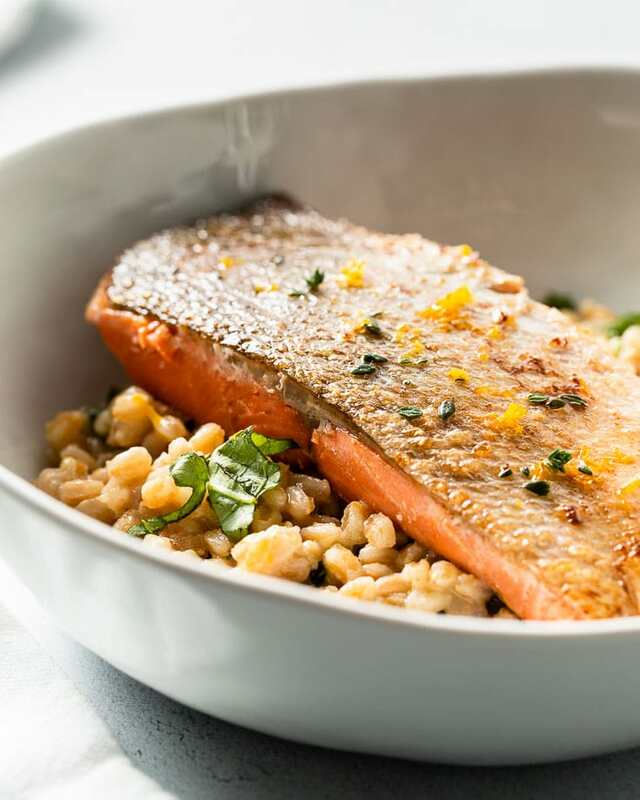 Healthy, nutritious and oh so delicious sous vide wild Alaskan salmon over the top of Meyer lemon-farro risotto. These salmon bowls are heart-healthy and nutrition packed. 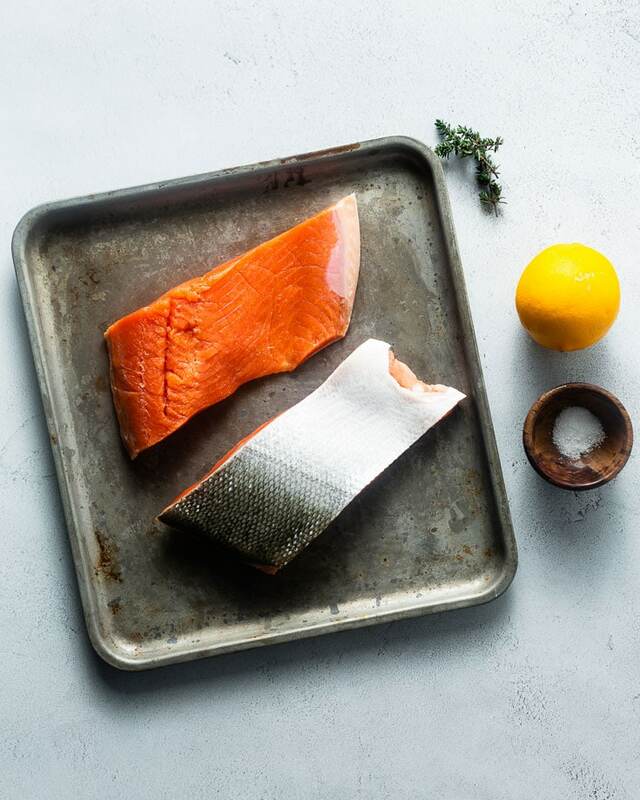 This post was created in an ongoing partnership with Copper River Salmon, where the finest wild salmon in the world comes from. 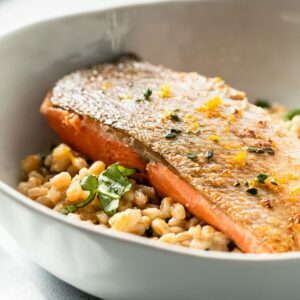 February is National American Heart Month, and there’s no better way to take part than with something that will help make you feel-good happy and healthy as a bowl of perfectly cooked wild Alaskan salmon with creamy and bright meyer lemon farro risotto. Wild salmon is a beautiful thing. It’s one of the healthiest and nutrition packed proteins that we have access to, and it’s a total treat that we should indulge in as often as possible. Not only is it one of the most diverse proteins in the ways that it can be prepared, but it also has numerous health benefits. Visit Healthline for more health details on the above benefits. 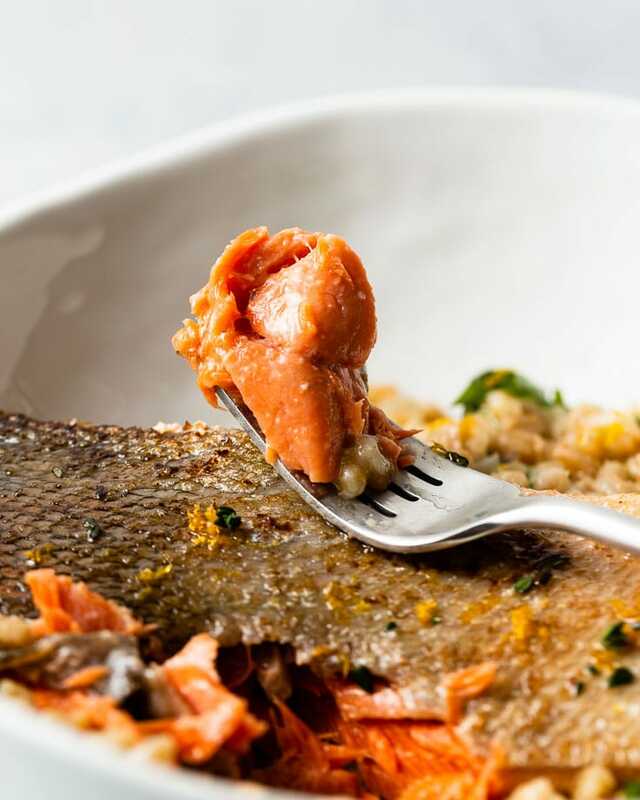 When you have a beautiful ingredient like wild salmon, you want to treat it with all the respect it deserves. Cooking it with the sous vide method gives it that respect and guarantees that it will come out perfect every time. Start by brining the salmon filets. This important step not only seasons the inside of the fish, but it keeps the white liquid from seeping out during the cook. Rinse and pat dry the filets once they are finished brining. Pre-heat the sous vide water bath to 125°F (or your desired temperature. 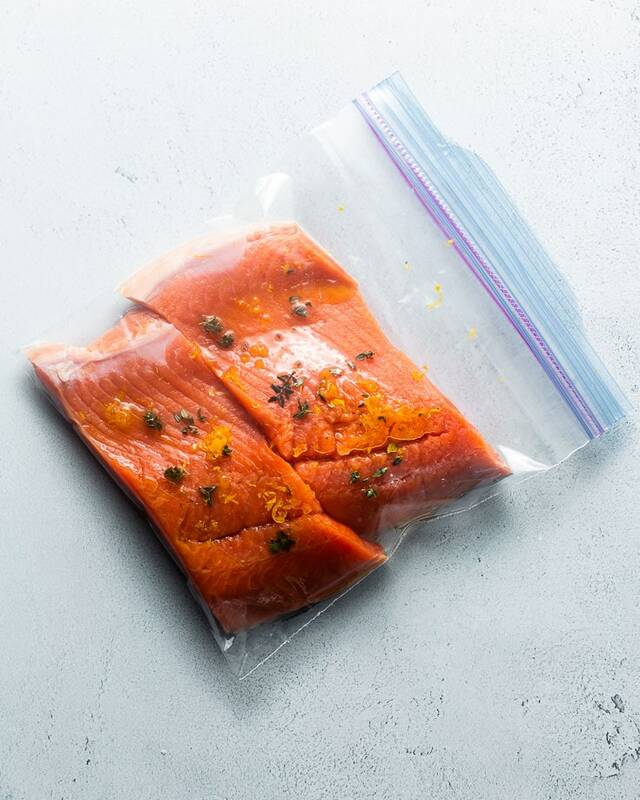 Place the salmon in a vacuum seal bag or a ziplock bag and drizzle on a little extra virgin olive oil along with some meyer lemon zest and fresh thyme. Sous vide the salmon for 45 minutes to 1 hour, then remove from the water bath and then from the bag. Pat dry and sear the skin side down in a very hot skillet with olive or canola oil to crisp up the skin for no more than 30 seconds. 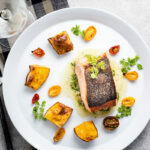 Don’t have a sous vide machine? No problem. 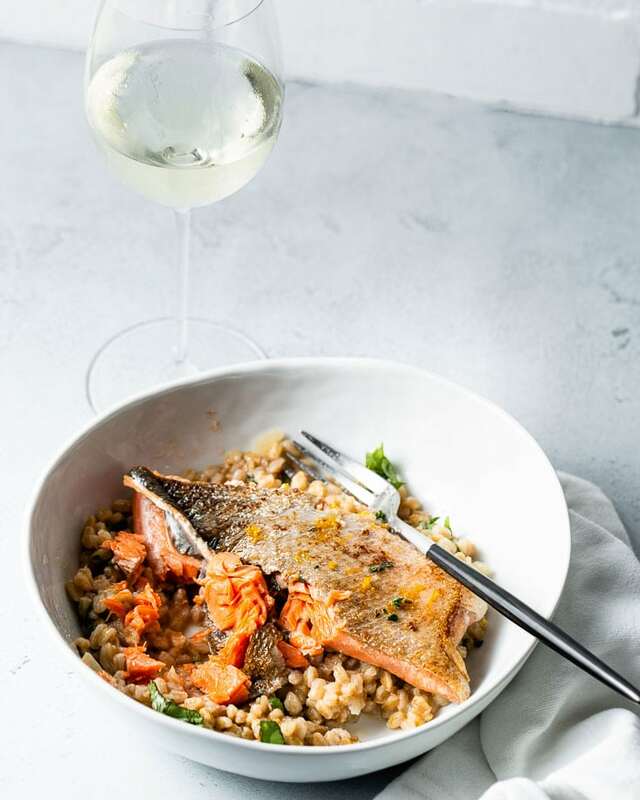 The salmon can be cooked on the stove, in the oven or on the grill and it will still be delicious with the meyer lemon farro risotto. 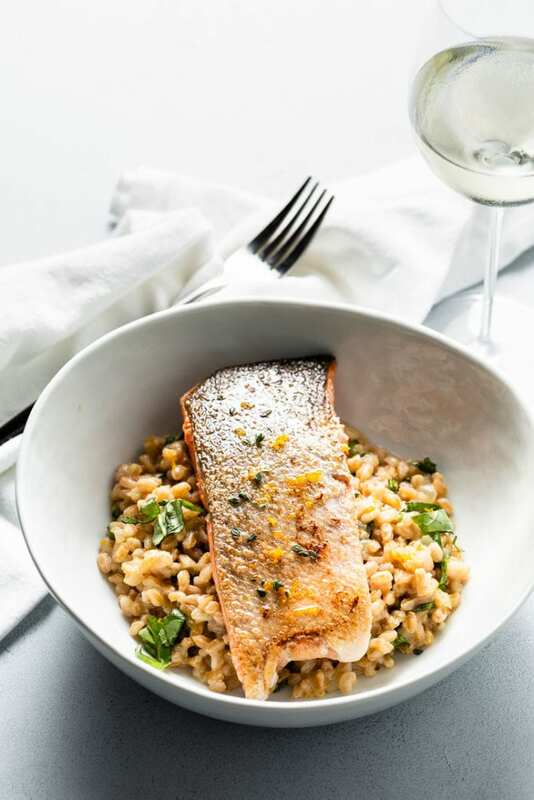 While the salmon is cooking, make the risotto. 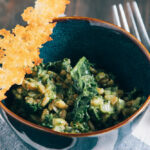 The technique of making risotto is pretty much the same no matter what type of rice or grain you are using. It is the process of adding a flavorful liquid a little at a time until it is fully absorbed, then repeating until the grain is fully cooked. We start by sautéing chopped onion, then add in the farro to lightly toast it. 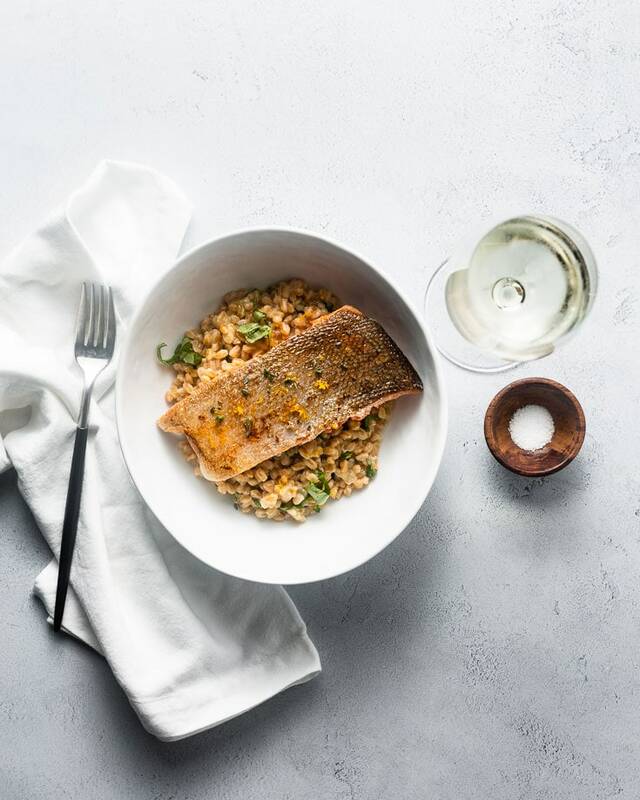 A little dry white wine is the first liquid added which kicks-off the cooking process and adds a little acidity to the risotto. After the wine is absorbed, chicken or vegetable stock is added about 1 cup at a time while stirring every few minutes. Once the stock is absorbed, more is added and the process continues until the farro is fully cooked. The risotto is finished by adding freshly grated parmesan cheese, a little butter, meyer lemon zest, meyer lemon juice and some freshly chopped basil. It’s super important to taste it (be careful, it will be hot) and season with kosher salt and freshly ground pepper once all the ingredients are added. You can check out the equipment used (below) or check out the post all about Essential Sous Vide Accessories. Contains affiliate links where I might receive a commission if you make a purchase, at no additional cost to you. Make the brine by dissolving 1/4 cup salt in 1 quart of cold water in a medium bowl. Place the salmon filets in the bowl and brine for 30 to 45 minutes. Pre-heat the sous vide water bath to 125°F. Rinse the salmon with cold water and pat dry with a paper towel. Place the filets in a ziplock bag with a drizzle of olive oil, lemon zest and chopped fresh thyme. Use the water displacement method to remove air from the air and seal the bag and cook for 45 minutes to 1 hour. Remove from the water bath then remove the salmon from the bag and pat dry with paper towels. 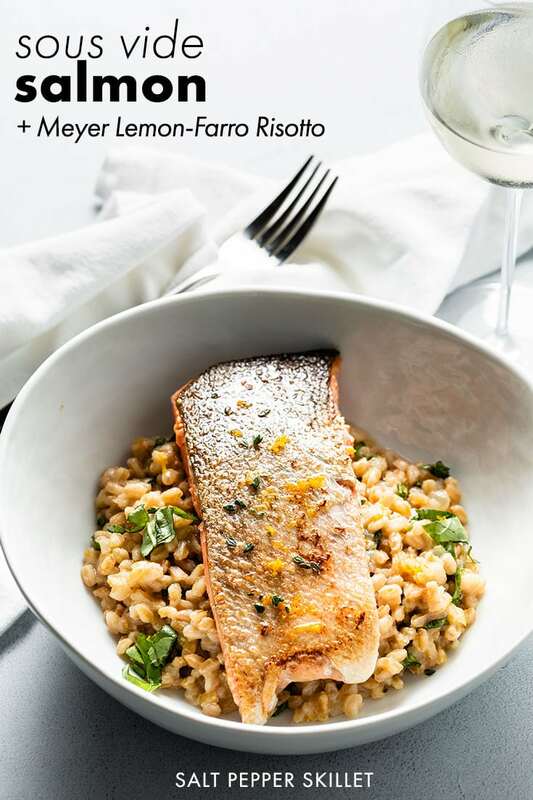 To sear the salmon skin: Heat a skillet over high heat with a drizzle of olive or canola oil. Sear the skin side for 30 seconds. Bring the chicken or vegetable stock to a boil in a small saucepan. In a separate large saucepan, heat 2 tablespoons olive oil over medium-high heat. Add the chopped onion + 1/2 teaspoon salt and saute the onion until it is soft and translucent but not browned, about 4-5 minutes. Stir in the farro and cook for about 2 minutes to lightly toast the farro. Pour in the wine and stir constantly with a wooden spoon until the liquid is almost fully absorbed. Start adding the boiling stock 1 cup at a time, stirring every few minutes until the liquid is absorbed. Continue adding stock until the farro is cooked (you will need to taste frequently to know when it is ready). 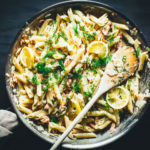 Finish the risotto by removing from the heat and stirring in the parmesan, butter, meyer lemon zest, lemon juice and the freshly chopped basil. Taste for seasoning and add more salt or lemon juice as needed. Since the salmon is brined before it is cooked, it’s not necessary to season it with salt before cooking.